$85.00 In stock. Order in the next 14 hours, 8 minutes and it will go out today! A Trip to The Circus is an effect inspired by David Copperfield and Frederic Culpit's classic Abbotts's Bathing Beauty effect. In this, George Iglesias brings us his children's version as a 7-minute solid comedy routine with a great twist and plot that's ready to entertain audiences of all kinds! The magician selects a child from the audience and shows them six cards with circus animals printed on. Now the child freely selects one card, memorises the animal and shows it to everybody except for the magician. The card is returned to the deck and shuffled into the other cards. Next the magician announces that he will make the animal vanish and travel to a 'Magic Circus'. He waves his hand over the pack of cards and either the child or the magician can display the cards to find the animal selected has disappeared completely! The magician now says that he is going to bring the child to that 'Magic Circus' by using their imagination. A large poster is shown with the figure of a classic magician wearing a tuxedo, a red bow tie, a red cummerbund, a magician's top hat and a magic wand. 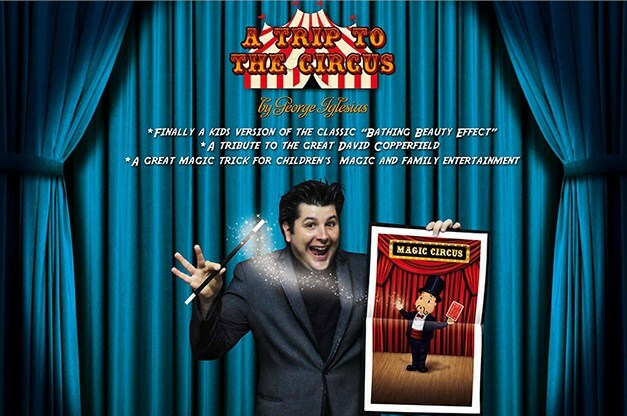 Most importantly, the magician on the poster is holding a card in his other hand. The problem is that the card is an actual drawing on the poster and the back is facing up, so there is no way to see if the card really traveled to the 'Magic Circus'. The magician now folds the poster and asks the child to insert his hand inside to take out the card, but the child will remove the magician's magic wand instead. "Oh no! You were supposed to take out the card not the magic wand! ", you state. The poster is opened and the drawing is missing the magic wand. The poster is re-folded and the child is asked one more time. This time however they will take out the magician's top hat. "Oh no! You were supposed to take out the card not the magicians TOP HAT! ", you state. The poster is opened again and the drawing is now missing the top hat, and the children can see the magician was hiding a bunny on top of his head and that he is also bald! All of the children will be laughing at the situation of the child taking other things instead of the card, so the magician decides to insert his hand this time. As with the child, the magician ends up doing the same and takes out one card facing back, but by mistake also takes with it a red cummerbund without noticing it. The children laugh even more and immediately inform the magician of what's going on. As soon as the magician sees his mistake, he puts the red cummerbund aside and asks the child to name the animal they selected. As soon as the animal is named, the card is turned around to discover it is exactly the same animal and card that was selected! At the end of the routine all of the children will ask to see inside the poster. When the magician opens the poster open again they can clearly see that the magician's pants are down, and he is wearing funny underwear and a bunny in front of the poster. The children will be laughing at this comic situation. Very easy to perform and operate!